Aliens on Vacation by Clete Barrett Smith. Grades 4-7. Disney/Hyperion, May 2011. 250 pages. Reviewed from ARC snagged at ALA.
Aliens on Vacation is a funny science-fiction romp that'll be a great summer read for young sci-fi fans. I was sold on this one when one of the Disney/Hyperion editors read from it at a preview at ALA Midwinter. Not only is it laugh-out-loud funny, but it chronicles a summer in Scrub's life that's filled with big changes. He has his first job, learns responsibility, lets down someone he loves, and has his first kiss. There's a lot of growing up here, but it's cleverly disguised in a silly story about aliens. As it is, I think it's a good choice for reluctant readers and it would have been a great choice for reluctant readers if it had been shorter and tighter. Scrub and the cute girl-next-door Amy go back and forth for quite a bit, her trying to get close to him and him pushing her away for fear she'd figure out that the guests at the inn weren't typical tourists. And there's a point where I couldn't help but think of Fred Savage asking skeptically, "Is this a kissing book?" So, just know that that's in there. It wasn't gratuitous (and certainly not graphic) and it felt right for the characters, but I get requests for sci-fi/fantasy books for boys who do not want romance at all and this might be enough for them to put the book down. This is a great choice for kids looking for funny books or science fiction books (or both). It gets bonus points for being a sci-fi story that doesn't feel like a sci-fi story (so it'll appeal to those kids being forced to read a sci-fi book for school). I'd try it on fans of Bruce Coville. This is Clete Barrett Smith's debut novel and a sequel is due out next year. 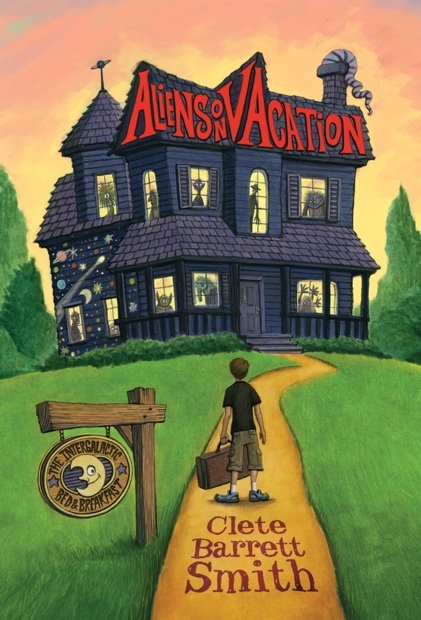 Aliens on Vacation will be on shelves May 3!